101 – for non-emergency situations - for example where no immediate police response is required or does not require police attendance at all. Individual officers - If you know the identification (collar) number of a particular officer, you can leave a message. Dial 101 - follow the instructions and when prompted, enter the officer's identification number to leave a message. 0800 555 111 –Crimestoppers - If you have information about crime and want to remain anonymous. 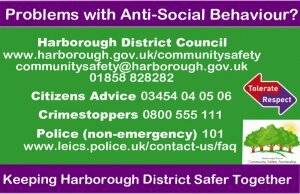 Harborough District Council Safety Partnership have designed this fridge magnet to make reporting anti-social behaviour easier. These can be collected from the Symington Building in Market Harborough.